Keeping on top of multiple software platforms can take hours — linking your Membership Management System to your social media accounts or Google calendar, for instance, can involve hours of manually transferring data, or some very complex coding. That’s why we created an integration between Wild Apricot and Integromat. Integromat is a tool you can use to connect Wild Apricot to over 230 other popular apps and software, without writing any code. Once you've set the task you want Integromat to complete, you won't need to do any manual work — and, best of all, it can take just a few minutes to set up. Check out this introductory post for more details on what Integromat does, how to get started with an account, and some ideas of ways to use it. If you’ve already created an account with Integromat, you might have seen the term 'scenario' — in Integromat, this refers to a series of automated actions that complete a task. A good place to start is by testing out the scenarios in our pre-loaded templates. 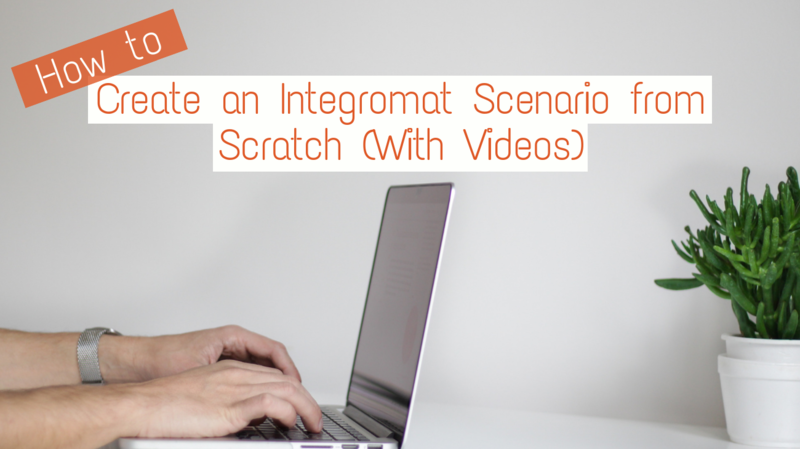 This blog post will suit you if you’re ready to take the next step and create your own scenarios; if you're looking to set up an Integromat account, this introductory post will be a better fit. In this post, I’ll show you how to create a simple scenario from scratch, complete with videos showing every click. For this post, I created a simple scenario that automatically tweets a reminder of the name and time of any event happening that day, and repeats every morning. This scenario could be helpful for any organization that runs regular events — or you can just practice the methods used here to create your own scenario. A scenario is a series of tasks you can set up to run automatically. You can choose to include tasks that use Wild Apricot or any of the other apps Integromat integrates with, and you can make a scenario of any length or complexity. Each scenario is made by connecting modules — each module is a task you set to be automatically completed, and can use data gathered from previous modules. You can add filters between modules, to select which types of data should be transferred between them. Before you can create an Integromat scenario, you need to authorize Integromat as an external application within your Wild Apricot account. If you haven’t done so yet, you can follow these steps. Log in to your Integromat account, and go to the Dashboard. You can then select some modules you want to start with, although you can also skip this step and add them later. For this scenario, search for Wild Apricot and Twitter and click the icons to add them. To add your first module, click the question mark. This will bring up a menu where you can choose the app you want to connect. In this case, Wild Apricot appears right away because we selected it when setting up the scenario, so you can just click the icon. When you select Wild Apricot you’ll be shown a list of actions you can take with this module. For this scenario, select Events > Get event list. This accesses information on events from your Wild Apricot account that can be used in the next module. Before you can access data from your Wild Apricot account, Integromat will need to connect to it, so you'll see a popup titled Connection. As you can see, my Wild Apricot account is already connected, but if yours isn’t you can click on the Add button and copy and paste your Wild Apricot API key in to connect. Read more about how to do this here. In this popup you can also choose which events to include based on their tags or date. For this scenario, you don’t need to change anything here — just click OK.
To add another module, click the handle on the right of your first module. As before, click the question mark and select the app you want to use. For this scenario, click on the Twitter icon. Select Create a tweet from the list. When you select Create a tweet in the step above, a menu will appear. The Connection box shows whether you have connected a Twitter account to Integromat by using an API key. This will open another menu, where you can set a name for this connection and choose to follow Integromat on Twitter. Click Continue — if you’re logged in to your Twitter account, click Authorize app to complete the connection. Create the content of your tweet by writing in the Status box. 1. Event name. With your cursor at the point in the text where you want the event name to be (location A in the diagram below), select Name from the list of data options on the right. With your cursor at the point in the text where you want the event time to be (location B in the diagram above), select the FormatDate function from the data options on the right. You can find this and other time and date functions by clicking the tab with the calendar icon (see below). In the position labelled C, click the StartDate option to add it. In the position labelled D, enter the tokens for how you want to format the time. For this scenario I’m setting it as HH.mm — this will show 24 hour time including minutes, and with leading zeros. You can see a guide to date and time tokens here. For this scenario, we’re only sending out tweets for events that are happening on that day, so we need to filter out events that don’t match that date. To create a filter that limits what data is passed between the modules, click on the wrench icon between the two modules, and then select Set up a filter. Label your filter to make it clear what it’s filtering for. The conditions of the filter need to format the event start date and today’s date in the same way, so that the two dates can be compared, and only if they’re recognized as the same date the event details will pass through the filter to the Twitter module. In the first Condition box select the FormatDate function. Inside the first bracket, insert StartDate from the menu on the right, and after the semicolon enter ‘DD.MM’ — this will format the date as the day of the month and then the month number. Set the condition to be that the two fields are Equal to. In the second Condition box, set up the same function but use today’s date: instead of inserting StartDate inside the first bracket, insert Now from the menu on the right. Click OK to save the function. That’s the scenario finished! To schedule when the scenario should run, click the clock icon. To run this scenario every day, select Every day from the drop down menu under Run scenario. This will show you the option to select what time the scenario should run each day. To check the scenario, click the Run once button on the left. If there are any errors when the scenario runs, you will see alerts that let you know where the issues are. To check your scenario has posted successfully, you can check your Twitter profile. As you can see, my tweet has published, letting people know about the Fall Conference happening at 8.00AM that day.